Most of the margaritas on my site are made with tequila, but using its cousin mezcal instead can make for a interesting drink. Both tequila and mezcal are made from the agave plant. However, unlike tequila, the agave is roasted, giving the spirit its distinctive smokiness. 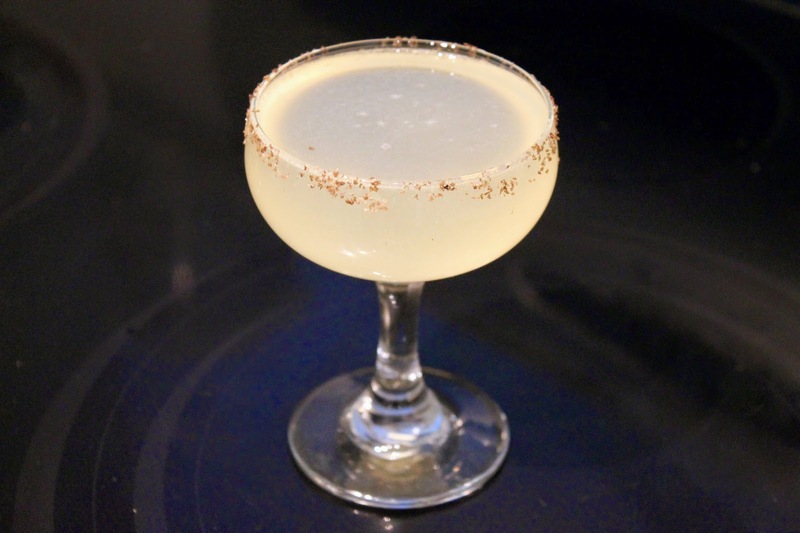 In a margarita, mezcal balances the drinks typical sweet and tart flavors with a smoky edge that I love, like in this Smoky Pear Margarita. I used Marca Negra Espadin Mezcal for this drink, which is a particularly smoky mezcal, less citrusy than the Del Maguey Vida mezcal I also sometimes use. When buying mezcals, I would steer clear of any that have insect larvae in them. It's just gross and not necessary (I've read it was a marketing gimmick started in the '40s). Combine mezcal, pear liqueur, lemon juice, lime juice and agave nectar in a cocktail shaker. Add ice and shake until very cold. Rub the fleshy side of the small piece of lime along the outer rim of the glass. Place about 1 tsp. smoked sea salt in a pile on a plate, then dip and rotate the rim of the glass through the salt to make a light salt rim. Strain the drink into the glass.